Ward, who was 70, appeared in several films throughout the 1970s and 1980s, including The Three Musketeers. He also starred as Bishop Gardiner in The Tudors and as Sir Monty in the popular BBC television series Judge John Deed. 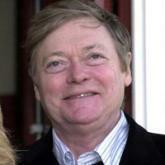 A statement released by his agent said he passed away peacefully with his wife Alexandra and daughters at his bedside. The son of a car salesman from Beckenham in Kent, Ward joined the National Youth Theatre at the age of 13 where he remained for eight years. After attending the Royal Academy of Dramatic Art, he worked in repertory in Northampton, Birmingham and Oxford, and occasionally in London's West End. Ward's break into the theatre came in 1967 when he played the lead in Joe Orton's play, Loot, which paved the way for television and film roles. In 1972, he gained national acclaim for his portrayal of Churchill in Richard Attenborough's epic film Young Winston, which featured a distinguished cast including Anthony Hopkins and Anne Bancroft. The following year, he played the Duke of Buckingham in The Three Musketeers. In 1974, Ward was cast as the author and veterinarian, James Herriot, in the original film adaptation of All Creatures Great and Small. All Creatures Great and Small later became a successful BBC television series with actor Christopher Timothy taking the lead role played by Ward in the film adaptation. In more recent years Ward returned to theatre, touring the country with plays such as Alan Bennett's The Madness of George III and Oscar Wilde's An Ideal Husband. Actress Susan Penhaligon, who starred alongside Ward in The Madness of King George III, said he had been a "loyal and sympathetic friend". "He was a witty, frighteningly clever and handsome, complex man who I worked with a lot," she said. Ward had triumphed in the play, she said, adding: "He showed such courage because I think he was ill then; he was a very courageous man." Alastair Whatley was one of the last directors to work with Ward, on The Madness of George III. He said: "Already in declining health Simon took on the one of the most challenging roles written in recent years and furthermore agreed to tour with the production all over England to venues often rather off the beaten track." In 1987 Ward suffered a serious head injury in a street attack that was never solved. Ward's daughter is an actress, Sophie Ward. His youngest daughter, Kitty, is married to the comedian, Michael McIntyre.